Saturday morning dad and I took the little blue tinnie back up to Hinchinbrook for round 2 against the mighty Barramundi. We launched at Fishers Creek for the short run up around the Benjamin Flats area. 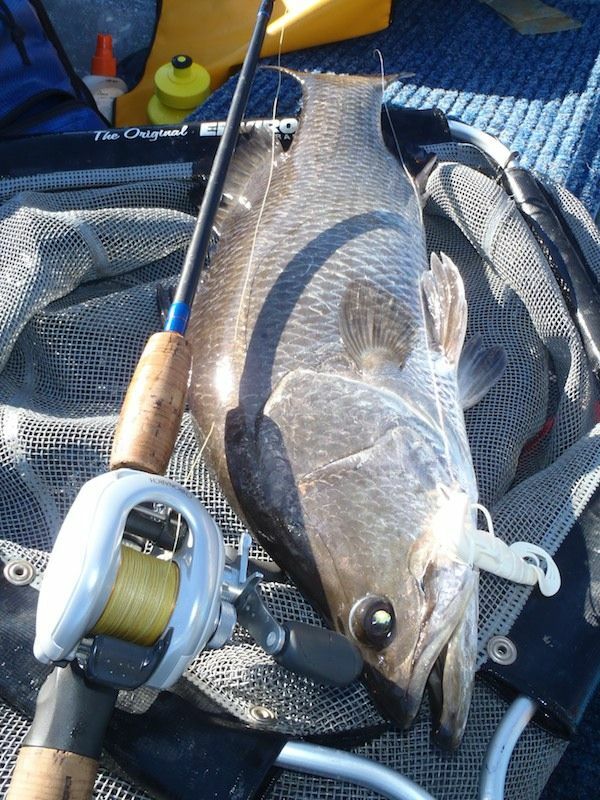 To cut a long story really short, we had a great morning session boating 7 or 8 Barramundi before 9am. Biggest went 67cm with most in the low 60's. But once the tide bottomed out just after 9am the bite just stopped! We then fished the full incoming tide for not much more than a couple of Cod, a small Jack and one lone Grunter. We bailed about 4pm wondering where the Barramundi had disappeared to. Again the 4in Atomic Prong we deadly amongst the snags. As a word of caution. If you launch at Fishers Creek at all, make sure you have a GPS. Its a maze of small creeks up there and very easy to get lost. There is, however, very good 3G mobile reception up that way. I was able to use my iPhone and Google Maps to navigate back to the ramp.